Researchers from the University of California-Davis are studying a type of pavement called open-graded friction courses (OGFCs), which have been used on roads in the United States since the 1950s. They recently used Imaris to study the microstructure and microstructure movement of these asphalt mixes under full-scale traffic to better understand how these properties affect performance and failure. 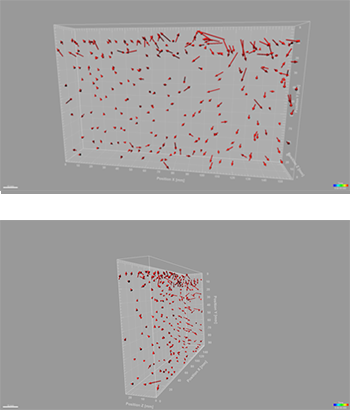 These images show the distribution of displacement vectors for one of the 20 mm segments from an asphalt block. Most of the displacement after trafficking accumulated at the top, in the OGFC layer. Images courtesy of Erdem Coleri. OGFCs offer faster drainage, less splash from vehicles, improved driver visibility, reduced traffic noise, improved surface reflectivity, increased surface friction, and cleaner runoff. While some states report good performance from OGFCs, others have experienced problems that led them to stop using this type of asphalt mix. A better understanding of why OGFCs sometimes fail would provide information that could be used to design optimal OGFC layers. The researchers used X-ray CT imaging to study the microstructure of OGFCs as well as the dense graded asphalt concrete (DGAC) typically used under layers of OGFC. They imaged blocks of OGFC and DGAC layers before and after pavement testing and then examined changes in air-void and aggregate distributions to evaluate the rutting mechanisms of the OGFC on DGAC asphalt concrete sections. The pavement testing was conducted using a heavy vehicle simulator, a mobile load frame that uses a full-scale wheel to simulate traffic. The researchers used the Imaris spot-tracking algorithm of Imaris to determine how particles permanently moved after trafficking. To defineFor spots segmentation, they combined adjacent voxels with close intensity in the X-ray CT images taken before and after trafficking. The particle tracking results showed that most of the shear flow at the DGAC layers appeared to be in the downward direction, suggesting that shear flow at the DGAC layers did not significantly increase the height of humps. The OGFC layers did not show significant shear flow. The researchers then used the Imaris particle tracking information to develop displacement vectors. Since the spots at the bottom of the block were most likely stationary, the researchers used these spots as reference points to match spots in the images acquired before and after trafficking. The displacement vector analysis showed that displacement accumulated at the OGFC layers for all the test sections and that significant displacements also occurred at the DGAC layers. They also found that OGFC layers with significantly higher air-void contents showed densification-related deformation and produced larger deformations. Deformation of the DGAC layers was also a significant factor affecting surface rutting. Dr. Coleri says that Imaris provided information that explained the failure mechanisms of the road materials tested in the study. In addition, the cumulative distributions of the displacement vector lengths from this study can be used to calibrate or validate multi-scale continuum mechanics and discrete element method models. Research paper: Erdem Coleri, John T. Harvey, Kai Yang, John M. Boone. 2013. Micromechanical investigation of open-graded asphalt friction courses’ rutting mechanisms. Construction and Building Materials 44: 25-34.